OK, so what plane do most people think about when someone mentions a smoothing plane? A #3 or #4 seems to be most common, but the “smoothing plane” moniker does reach from a #1 on up to the #4-1/2. All are good planes, but there is another choice that is often overlooked, and it just happens to have a bit more flexibility, as well. The plane I’m referencing is the #164 Low Angle Smoother. The #164’s iron is ground at 25 degrees, and is bedded at 12 degrees with the bevel up. This configuration is ideal for planing end grain, but can do so much more. Many times I will utilize this same configuration of honing angles to plane reasonably straight face grain, with good results. If I start to encounter some difficult or crazy grain, increasing the honing angle of the iron can easily resolve any tearout. Specifically, honing the iron with a 45 degree bevel, which along with the bedding angle, will present a 57 degree cutting angle, resolves many issues with crazy grain. One other feature on this plane that makes a huge difference is the adjustable mouth. This feature allows the end user to dial in the ideal balance of fiber support and chip clearance. If you are working to flatten a board with very figured grain, another alternative is to use a specialty blade – the toothing blade. The toothing blade has a large number of very small teeth (.030” wide and .030” between teeth) and due to this configuration, does not have the tendency to dive into the grain, like normal irons can. As you might imagine, after using a toothing blade, the wood surface is rough even though the wood has been flattened. You will want to follow up with a freshly sharpened standard iron to finalize the surface. There is one more specialty iron available for the #164. The 90 degree scraping iron. This still beds at the same 12 degree angle, but the edge of the blade is presented to the wood in a scraping orientation, and even though it looks different than many scrapers, works very well. 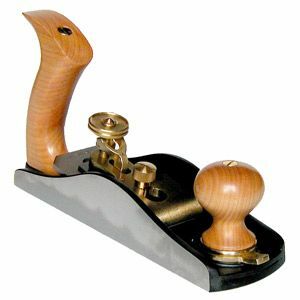 When I write about sharpening plane irons, there is usually very little difference between one plane and another. The #164, however, has a very unique and sweet blade adjustment system. When preparing the iron for the #164 for the first time, there is one thing you’ll want to do before sharpening/honing. There is a small metal plate attached to the top-side of the iron. This plate interfaces with the overhead Bailey type iron adjuster, and its placement is critical for proper function and retaining the intended full adjustment range. To ensure the plate is the same distance from the cutting edge every time you sharpen, create a reference block on a piece of MDF. To set the block in the correct location, take the iron/plate combo out of the plane, and lay the iron on the MDF. Place it with the bevel facing down towards the MDF, the cutting edge of the iron towards the block, and the non-sharp end off the edge of the MDF. From this position, gently slide the iron forward until you feel the edge of the metal plate, closest to the cutting edge of the iron, make contact with the edge of the MDF. Since the metal plate protrudes slightly, it is easy to feel when the two meet. Now slide the stop block gently up against the cutting edge of the iron. Attach the block in this position, using whatever method available to retain this exact position. I have successfully used a small amount of superglue, on the bottom of the block, to initially hold it in place. Following this, I will use a couple of screws to make the connection solid. Pre-drilling the holes in the stop block is usually a good idea, so there is less chance of splitting the wood. I’ve written elsewhere in this blog about general sharpening. Take a look at that post for more info! When I work with the #164, I prefer to have a couple of the standard irons, with one honed at 30 degrees and the other at 45 degrees. This expedites the change from end grain work to crazy grain work in moments, by simply swapping out the irons. Then, based on the work, the specialty irons can add to the effectiveness of the #164, getting more bang for the buck, and widening the flexibility of this single plane. To take a closer look at the low angle smoother, click here. Turn Your Own Baseball Bat Check out the August issue of Wood News!